Tuesday August 15th 1922 We were up town in forenoon. I got some money at the bank. Slept early in PM. Mrs Stevens & Mrs Kirkpatrick here for visit. Wednesday August 16th 1922 We started to Olympia on stage at 10.15. Had dinner and looked at capitol building. Came back to Tenino Had a ride with Rob Cohoon out to mill camp. Pauline had supper waiting. Soon as we ate came home on Bus. Letter from M E Culbertson. It was a day full of sight-seeing. Thursday August 17th 1922 Lizzie and I were up town all forenoon. I wrote to M E Culbertson. I slept in early afternoon. Letter from Fern Patterson. Friday August 18th 1922 I washed a few things for myself in forenoon. Lizzie busy about home. Wrote Mattie Stitt & Ott Seibert. Home in evening. Saturday August 19th 1922 Did ironing sewed some for Lizzie. Iowa City papers today tell of the death of George Watson and Anna Lapeare Spencer. Fannie Graham came in PM and Art & Alice Robinson later. Letter from Laura Mason. 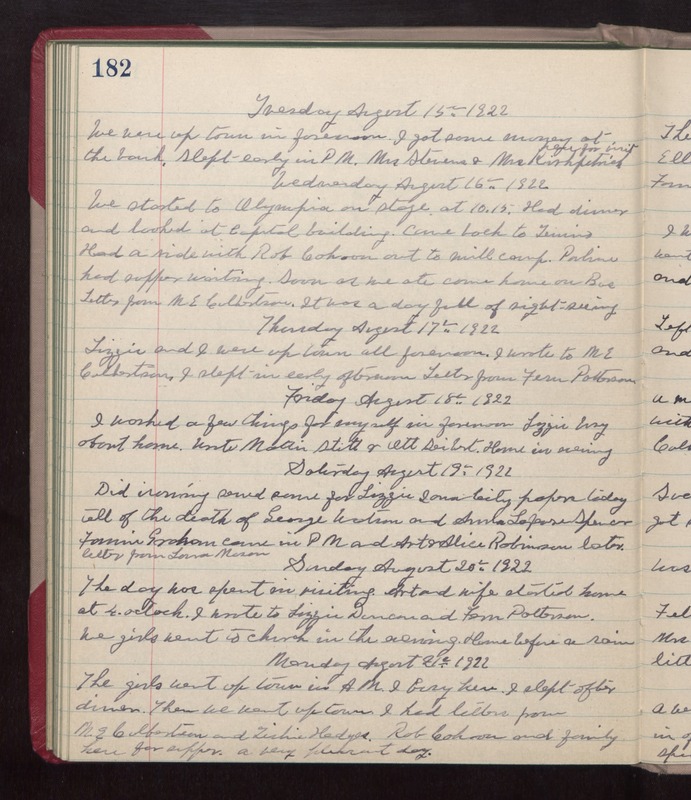 Sunday August 20th 1922 The day was spent in visiting. Art and wife started home at 4 oclock. I wrote to Lizzie Duncan and Fern Patterson. We girls went to church in the evening. Home before a rain. Monday August 21st 1922 The girls went up town in AM. I busy here. I slept after dinner. Then we went up town. I had letters from M E Culbertson and Tishie Hedges. Rob Cohoon and family here for supper. a very pleasant day.